Outbreaks of toxic algae, fueled by pollution from manure and fertilizer from farm fields, are increasing in frequency and severity across the U.S. 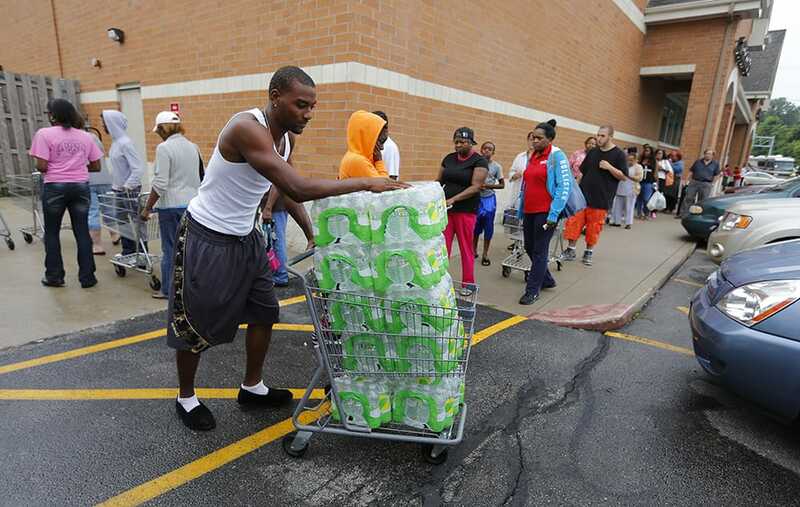 In 2014, a toxic bloom in Lake Erie imperiled the drinking water of 500,000 residents in Toledo, Ohio. The Lake Erie outbreak, now an annual event, is getting much worse. 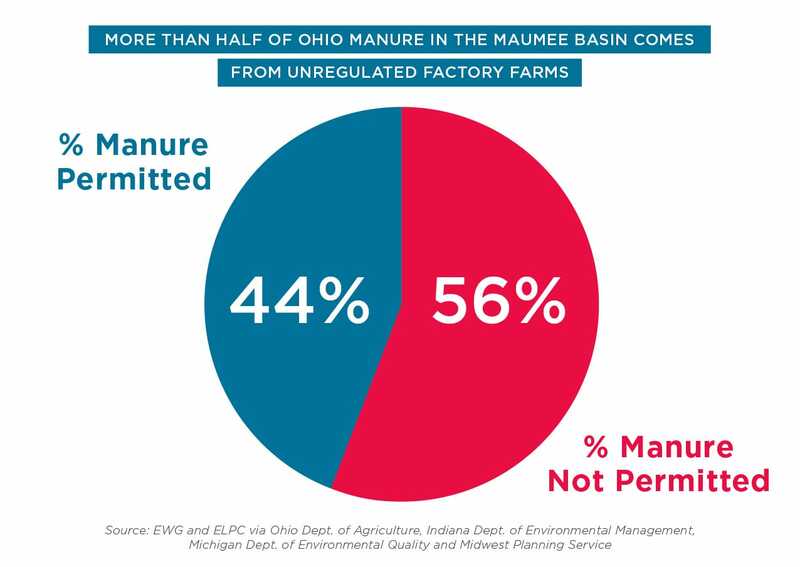 Up until now, there were shockingly scant, verifiable details about the role phosphorus-rich manure from factory farms in the Maumee watershed plays in the pollution pouring into Lake Erie. New EWG and ELPC data from aerial photos and satellite mapping reveals how rapidly factory farms have multiplied in the watershed, with weak or nonexistent oversight from environmental officials. Analysts found where the factory farms are, how many there are and – most critical for lawmakers and concerned citizens – how much manure and phosphorus is generated in the Maumee watershed. Where are the factory farms? The number of factory farms exploded from 545 to 775, a 42 percent increase. The number of animals in the watershed more than doubled, from 9 million to 20.4 million. The amount of manure produced and applied to farmland in the watershed swelled from 3.9 million tons each year to 5.5 million tons. Pollution from factory farms has been seriously underestimated as a cause of the toxic algae outbreak that wreaks havoc on Lake Erie every year. Overloading Lake Erie with phosphorus from fertilizer and manure feeds the toxic algae that infests the lake each year. 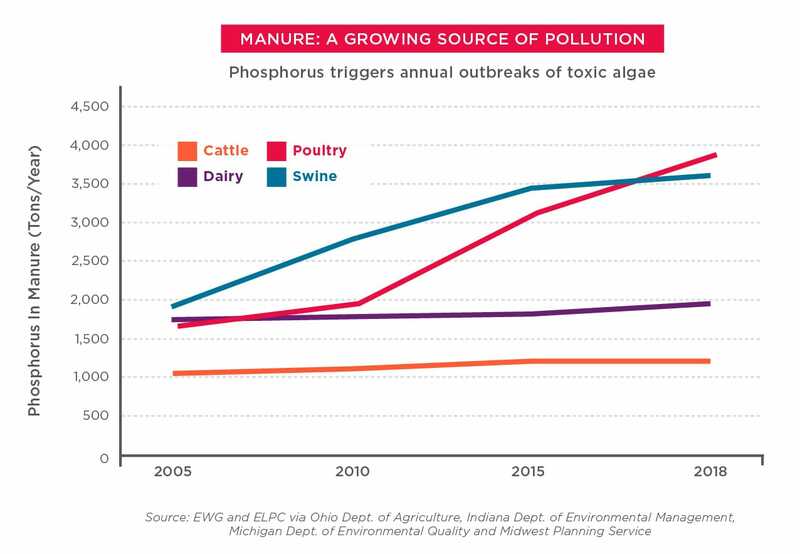 The amount of phosphorus added to the watershed from manure increased by a staggering 67 percent between 2005 and 2018. Today we estimate that manure adds 10,610 tons of phosphorus to farm fields every year. Meanwhile, phosphorus added in chemical fertilizers actually declined. Clearly, tougher regulation and more oversight of factory farms are needed to protect Lake Erie. Sixty-nine percent of all the phosphorus added to the watershed each year comes from factory farms in Ohio. Seventy-nine percent of hog manure comes from unregulated farms. So does 84 percent of cattle manure. More than half of all manure – from hogs, cattle, poultry and dairy – comes from farms that are not required to have permits. EWG thanks the Pisces Foundation and an anonymous donor for the support that made this report possible.